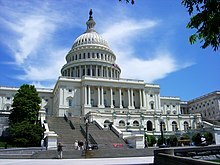 Tagann an Seanad le chéile sa Chaipeatól i Washington, D.C.
Is teach amháin de dhá theach Chomhdháil Stáit Aontaithe Mheiriceá é Seanad Stáit Aontaithe Mheiriceá. Is é Teach na nIonadaithe an teach eile. Tá dhá sheanadóir ó gach stát mar bhaill den Seanad. Tá 100 ball ann san iomlán. Bíonn téarma sé bhliana ag seanadóir. Roinntear baill an tSeanaid ina dtrí "rang" chun go dtoghfaí an tríú cuid den Seanad gach dhá bhliain. Roghnaíodh dálaí reachtais na stát na seanadóirí ar dtús, ach ón bhliain 1913 i leith toghtar iad trí mheán toghchán díreach. Tugadh an leathanach seo cothrom le dáta an 13 Lúnasa 2017 ag 00:26.